Updated Nov. 19, 1999. Please visit again. 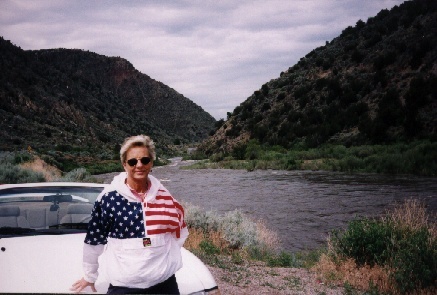 Betty Nolan with Mustang Sally by Rio Grande River Near Taos, N.M.
Part 3: Palm Desert and Palm Springs, Calif.
Part 5: Tubac, Ariz., West Texas and Hope, Ark. after 7 a.m. for the first really long vacation Betty and I had been able to take in 18 years. ending a consulting arrangement I had with Guardsmark, Inc. of Memphis. off from teaching high school students commercial food preparation and other skills. water out of the pool. growing old beats the alternative. and there, but it looked to me that I-40 was way beyond spot repairs in the worst sections. years. State government there is talking about closing some of the rest stops. scenery. The last time I drove through Oklahoma it was dry and summery dead looking. much higher prices that were coming in Arizona and California. Bumpedety, bumpedety, bumpedety, nearly all the way to Oklahoma City. they didn’t sell was beer. these vast, multipurpose gas stations reminds that they are still glorified truck stops. dinner that evening at a nearby Cracker Barrel Restaurant, near the Meridian Street exit. 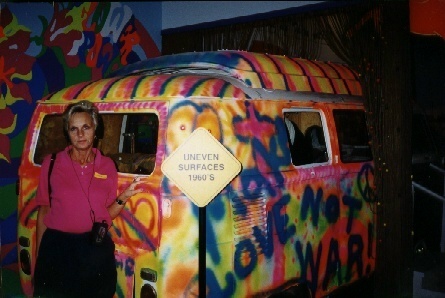 hitting the road at 9:15 a.m.
Betty Nolan with 1960's Hippie Van at Route 66 Museum, Clinton, Okla.
convertible, riding just like Betty and I did in my 1965 Mustang. 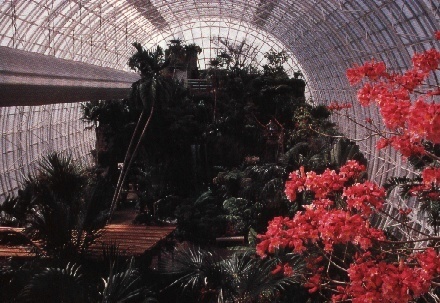 scenic spots and other stops along the way, many of which have long since disappeared. stayed there twice about 1964, when I was “commuting” to college in Mississippi. years and several boat tailed grackles. with emerald green leaves and other members of the cactus family were in full bloom. an attraction or make a detouring excursion. victims of the routing of I-40 several miles away from Tucumcari’s segment of Route 66.
the early 1960s when I used to drive through. hours to the west. So there really isn’t must reason to stop at Tucumcari any more. regretted eating it for two days. 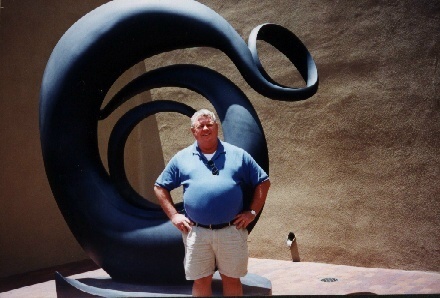 Lewis Nolan with Outdoor Sculpture at Georgia O'Keeffe Museum, Sante Fe, N.M.
Spanish in 1607, about the same time the English landed at Jamestown, Va.
five downtown museums for $10. saw one dealing in Polish folk art and another in Asian art. the jewelry and found it suspiciously like that she has purchased in Mexico for much less. represented at the Arts in the Park and Pink Palace Arts Festivals in Memphis. in the U.S., with 6000 rooms, 250 art galleries and 13 museums.